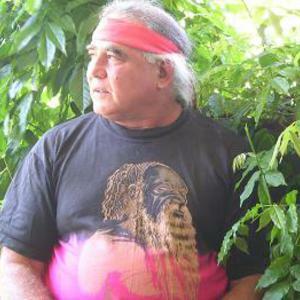 Kev Carmody is an Indigenous Australian singer-songwriter born in 1946 in Cairns, Queensland. His father was a second generation Irish descendant, his mother a Murri woman. The family moved to southern Queensland in early 1950. His parents worked as drovers there, moving cattle along the stock routes.1 At the age of 33 Carmody had the opportunity to go to University where he studied history, eventually finishing a PhD. While at university Carmody used his guitar as a means of implementing oral history in tutorials, which led to his career in music. His first album, Pillars of Society, was released in 1989 and drew heavily upon country music and folk music styles. Australian Rolling Stone described the record as "the best album ever released by an Aboriginal musician and arguably the best protest album ever made in Australia". In subsequent recordings he has adopted a broad range of music styles from reggae to rock and roll. On October 31st 2007 Carmody was a special guest at the TV music channel MAX's "The Max Sessions: Powderfinger, Concert For The Cure" singing alongside front man Bernard Fanning to the controversial 'Black Tears' and also joined in with the encore of 'These Days'. The concert was a fundraiser and thank you to the "unsung heroes" of breast cancer with an invite-only audience, made up of a special group of people ? those who have suffered and survived breast cancer and their support networks. The concert closed Breast Cancer Awareness Month and was the brainchild of 20-year-old Nick Vindin, who lost his mother Kate to the disease a few years ago. Carmody regularly tours Australia and internationally and is highly regarded by audiences and critics. He co-wrote "From Little Things Big Things Grow" with Paul Kelly on the The Gurindji Strike.